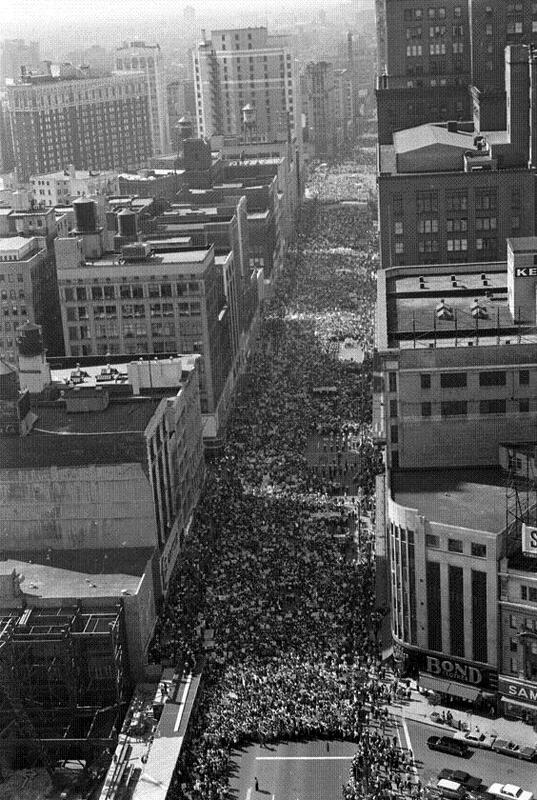 More than 250,000 march on Woodward during the “Great March to Freedom, June 23, 1963. This year’s Detroit Dr. Martin Luther King, Jr. Day March & Rally will represent the 10th annual commemoration held at the Historic Central United Methodist Church. This is the church where Dr. King delivered his annual Lent sermons and preached three weeks prior to his assassination on April 4, 1968. 2013 marks the 50th anniversary of the “Great March to Freedom” in Detroit where 250,000 or more walked down Woodward Avenue demanding jobs and civil rights. This demonstration held on June 23, 1963, was the scene where Dr. King delivered his first “I Have a Dream” speech at Cobo Hall. Later that summer on August 28, the historic “March on Washington” was held and Dr. King once again reiterated his dream of equality and freedom. Fifty years later we still have not achieved his dream or the desires of the majority of people within the oppressed and working communities throughout the U.S. and the world. In Michigan we are facing profound challenges with attacks on unions, the sovereignty of cities and their right to self-determination and self-rule. Internationally the U.S.-NATO wars against Afghanistan, Pakistan, Iraq, Somalia, Libya, Haiti and Syria continue, while our cities are facing mass unemployment, poverty, state-sanctioned violence and hostile takeovers by the banks and corporations through their agents in local and state government. Recent right-to-work laws and revised emergency management legislation will drive even more into economic distress and uncertainty. Therefore, our clarion call for 2013 is “Renew the Struggle for Jobs, Peace and Justice to Eradicate the Triple Evils of War, Racism and Poverty.” We will gather at Central United Methodist Church beginning at Noon on the federally-designated holiday in honor of the martyred peace, civil rights and social justice activist Dr. Martin Luther King, Jr.
We are encouraging the participation of those who were there in June 1963 or those whose parents and grandparents were there. We want to hear and read testimonials from that fateful period which led to the passage of the Civil Rights Act of 1964 and the Voting Rights Act of 1965. This year’s program will feature presentations from various organizations and activists in Detroit and nationally. Rev. C.D. Witherspoon, Baltimore President of the Southern Christian Leadership Conference (SCLC), the organization founded by Dr. King in 1957, will be the keynote speaker. Rev. Witherspoon is a leading activist in the struggle against police brutality in Baltimore. Other speakers will include: anti-foreclosure Attys. Vanessa Fluker and Jerome Goldberg, Prof. Charles Simmons and Sandra Simmons of Hush House as well as Rev. Ed Rowe, Pastor of Central United Methodist Church, who will deliver the invocation. We will hold a rally at Noon and march through downtown Detroit beginning at 1:30pm. After the march a community meal will be served at the church and a cultural program held on the second floor that is being coordinated by Detroit poet and lecturer Aurora Harris of Broadside Press. If you are able to contribute to this event it would be greatly appreciated. Send all checks and money orders to Detroit MLK Committee, 5920 Second Avenue, Detroit, Michigan 48202. To volunteer for that day contact (313) 405-2185.